Who remembers the pastoral life of some years ago he will remember this strange collar that the shepherds were usual to put to their dogs called in dialect "Lu vreccale" (the vreccale). 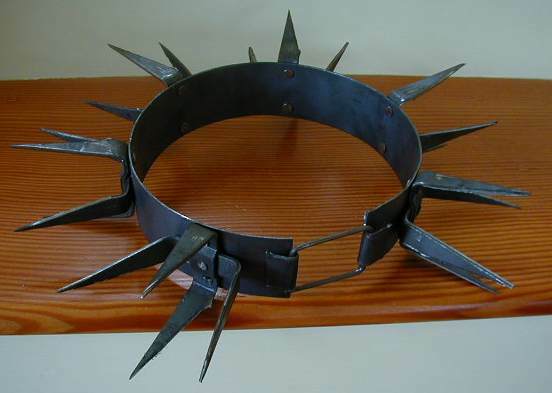 The " vreccale " is a collar of wrought iron used by the shepherds to defend his own dogs from the wolves. The wolf, in fact, tends to attack its prey at the neck killing it in little time. 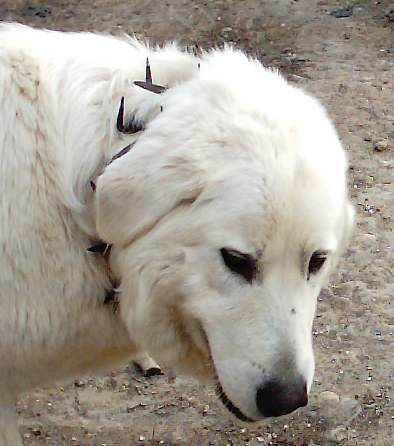 Until about thirty years ago, there was not a shepherd that didn't have a rich equipment of these collars, It is true that it is a little unpleasant to the dogs because of its weight and the excoriations that it provokes by catching in the hair. Various types existed of it, in leather or in beaten iron. 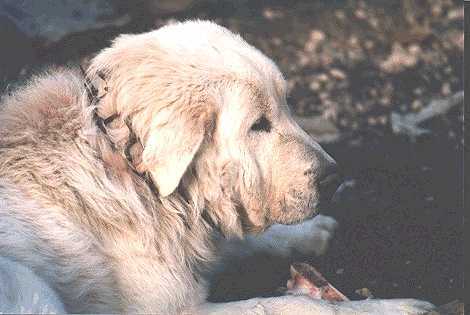 In the photos We see ORSO (above) and Sentinella (to the right) with their "vreccale". The Various Types of Vreccale. 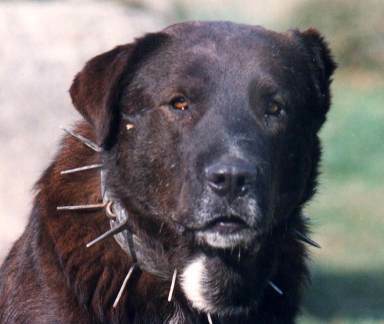 The use of these collars is not only a prerogative Abruzzese. in a lot of parts of the world the shepherds use these utensils that differentiate him between them from nation to nation. It often happens to see the same vreccale used in the distant zones between them thousand of km. Here is a presentation of various present vreccali in the different zones of the world. 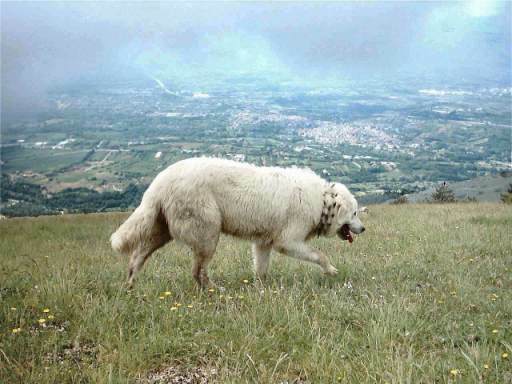 Italy is essentially present with the vreccalis Abruzzesi being is us in this region a vast and consistent presence of wolves. There were here also various types of vreccali. The more used were those of leather, to plaques and those formed by iron rods worked to the forge. In the photo to the right an old vreccale, with plaques, used by the shepherds of Pratola Peligna. To the right a typical vreccale in wrought iron used to Pratola Peligna and under the same vreccale used by Poppea. This vreccale asks for a hard-working workmanship to the forge. The iron is heated and therefore modeled by the blacksmith with a hammer and an anvil. it is amazing of as the present shepherds in different nations uses the same vreccalis. This is due to the fact that from the Roman period there were a lot of relationships among the various shepherds. 1) They used equal vreccali in Italy, Turkey, Portugal, Spain etc. 2) in the same nations there are very similar uses, costume and ways of raise the dogs. 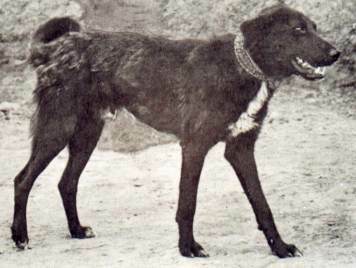 Says this him it is able without doubt to affirm that the various dogs used in the different zones have a common origin and they very probably have a very narrow relative than the various standards want to make us believe above all if it is thought that different races are found in different near regions between them. 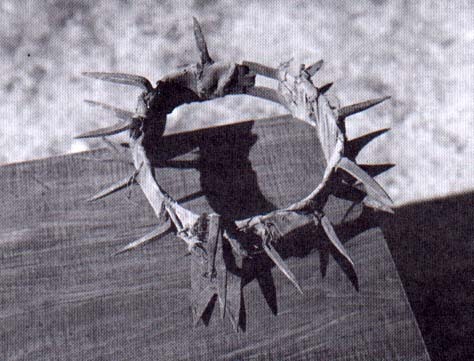 The alternative more used to the collar in iron was that in leather. 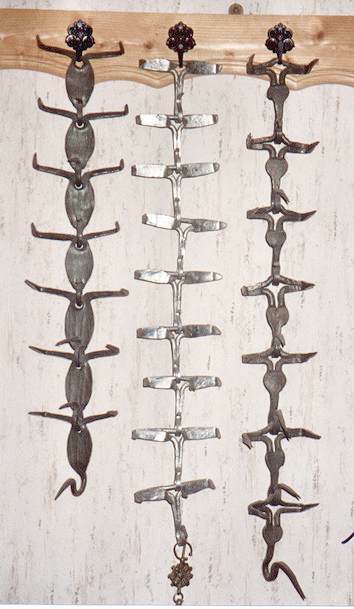 In Spain, besides the traditional collars in Iron these collars are used on also whose had fixed some nails. 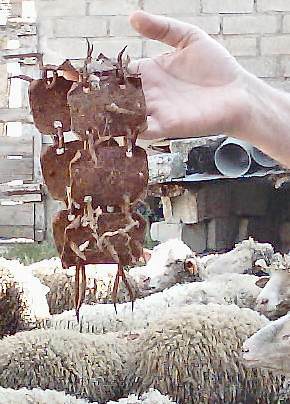 Also in Abruzzo they were many the shepherds that used these easier collars to realize and of contained weight. It essentially concerned a leather strip to which they had fixed some nails. 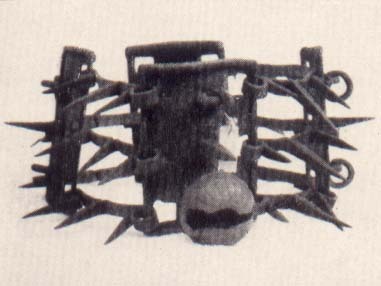 The head of the nails had covered from a second glued strip and sewn to hand. 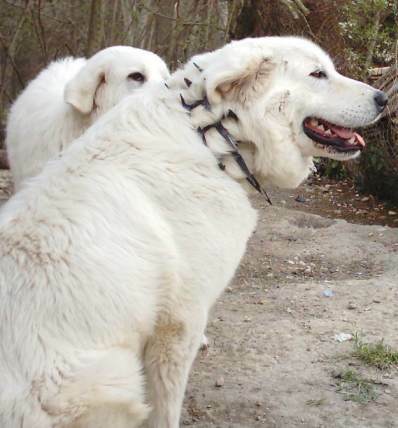 To the left other collars used in Turkey (photo Roland Kaschel). 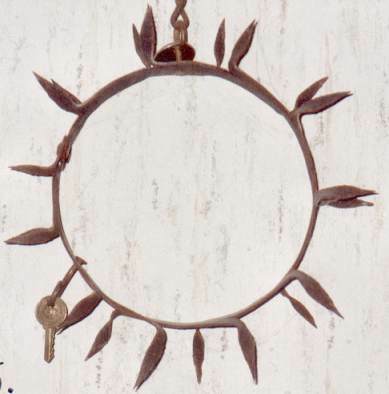 Another particular of a Turkish collar (photo: Janice Frasche) . 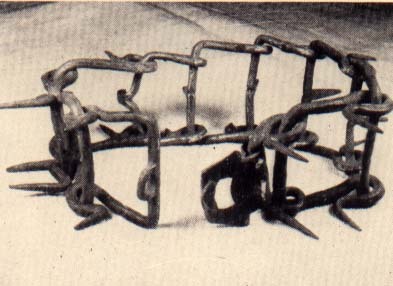 In low a collar used in Austria (Photo: Museum Graz). It is unbelievable the similarity with the type Pratolano. The Portuguese Collars "Coleira De Picos em Ferro"
In low a collar used in Portugal (photo: S. Passanha) Another collar used in Portugal. 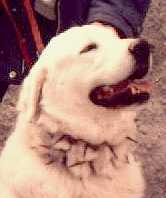 This plaques collar is very common, with to read differences, also in other nations. In Abruzzo it is diffused in a lot of zones (type of Pescocostanzo) .